99-06 Suzuki Chevy 2.5L 2.7L Engine Timing Chain Kit Water & Oil Pump H25A H27A. 99 - 06 SUZUKI / CHEVROLET. 2.5L (2500cc) / 2.7L (2700cc) DOHC (24-Valve) V6, "H25A" "H27A". 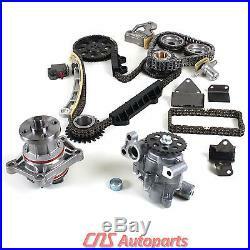 Brand NEW " TIMING CHAIN COMPONENT KIT + WATER PUMP + OIL PUMP ". 01 - 04 CHEVROLET TRACKER 2.5L 2500CC V6 DOHC 24V "H25A". 99 - 05 SUZUKI GRAND VITARA 2.5L 2500CC V6 DOHC 24V "H25A". 01 - 01 SUZUKI GRAND VITARA 2.7L 2737CC V6 DOHC 24V "H27A". 04 - 04 SUZUKI VITARA 2.5L 2500CC V6 DOHC 24V "H25A". 02 - 04 SUZUKI XL-7 2.7L 2700CC V6 DOHC 24V "H27A". 05 - 06 SUZUKI XL-7 2.7L 2737CC V6 DOHC 24V "H27A". 1 TIMING CHAIN main (crank to idler & cam). 1 TIMING CHAIN upper (right head cam to cam). 1 TIMING CHAIN upper (left cam to cam to idler). 2 CAM SPROCKETS exhaust (1-left & 1-right). 1 CAM SPROCKET intake (left head 24 teeth). 1 CAM SPROCKET intake (right head 48 teeth). 1 IDLER SPROCKET (upper 20 & 40 teeth). 1 GUIDE RAIL (LOWER RIGHT-INNER). 1 GUIDE RAIL (LOWER RIGHT-OUTER). 1 GUIDE RAIL (LOWER LEFT). 1 GUIDE RAIL (UPPER RIGHT CAM). 2 GUIDE RAILS (UPPER LEFT CAM). 1 WATER PUMP W/ 2 SEALS (INSTALLED). THE TEAM ARE HAPPY TO HELP. &###x200B;&###x200B;&###x200B;&###x200B;&###x200B;&##x200B. &###x200B;&###x200B;&###x200B;&###x200B;&###x200B;&###x200B;&##x200B. &###x200B;&###x200B;&###x200B;&###x200B;&###x200B;&###x200B;&###x200B; &###x200B;&###x200B;&###x200B;&###x200B;&##x200B. &###x200B;&###x200B;&###x200B;&###x200B;&###x200B;&###x200B;&###x200B;&###x200B;&###x200B;&###x200B;&###x200B;&###x200B;&###x200B;&##x200B. The item "99-06 Suzuki Chevy 2.5L 2.7L Engine Timing Chain Kit Water & Oil Pump H25A H27A" is in sale since Friday, April 13, 2012. This item is in the category "eBay Motors\Parts & Accessories\Car & Truck Parts\Engines & Components\Timing Components". The seller is "cnsautoparts" and is located in South El Monte, California.